First he lifts the greaseproof paper up. And then he puts the greaseproof paper down. Then it goes up again. Oh and now it's coming back down. But no, wait, the paper goes up once more and now he is shaking it about. The paper is going up and down, up and down, left and right, and we are all watching the paper; like the crowd at Centre Court, watching the ball slam to and fro across the net. Someone, trying to focus on the action through the screen on their iPad, gets so dizzy, they pass out and fall under the table. Eventually, after spending a few minutes excitedly explaining the magical properties of greaseproof paper, Daniel Galmiche, self-styled cuisinier and Michelin starred chef, finally places a square into the pan. "Voila!" he claps. "So if your non-stick frying pan is a little bit done in, a little bit knackered, zis is a trick you can do, to fry your trout, skin side down, wiz no worries." 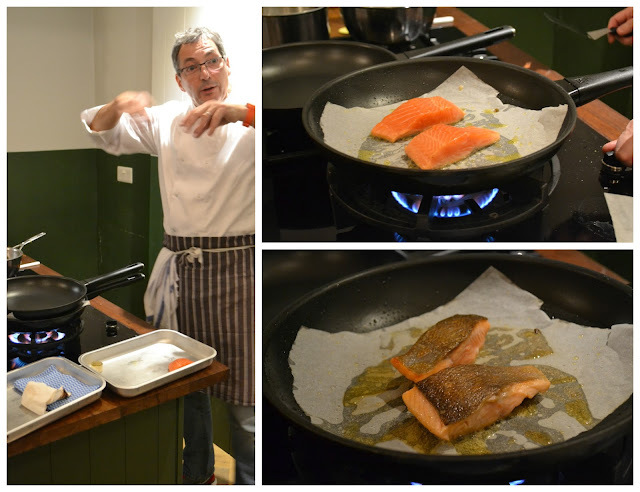 This was just one of the many tricks and tips that came our way during a fun cookery lesson I attended recently. 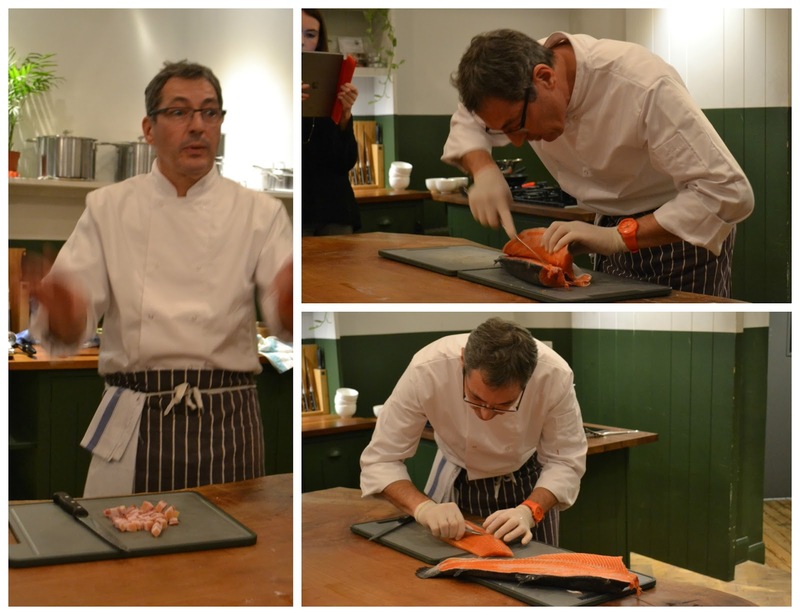 Run by Great British Chefs in partnership with the Norwegian Seafood Council, the lowdown on how to get the best out of Norwegian Fjord Trout was held at the bespoke kitchen above the main bar and restaurant at Bourne & Hollingsworth Buildings, in Clerkenwell. A personal and homely space that immediately puts you ease, over the usual sparse white and steel you often see at cookery schools. Adam Gray was also in attendance, being executive chef at B&H and all, and therefore the only person who knew how to switch on the fancy induction hobs we were using. Actually, Adam's steely presence served as a good counterpoint to Daniel's exuberant Gallic flair. Not that he didn't display any flashes of humour himself. During proceedings, Adam would often slyly point out that we were using good and proper British ingredients, such as rapeseed oil and bacon. As opposed to French. Which Daniel acknowledged with a glint in his eye and a slight widening of the nostrils. The pair, having worked together before with Raymond Blanc, were obviously used to sharing what is known as the 'bants'. Is that right, kids? All of which added to a convivial and relaxed atmosphere. 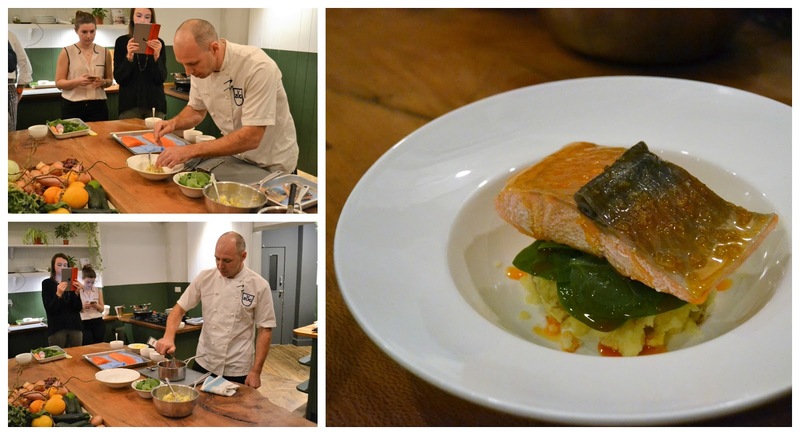 Getting stuck into Adam's easy to prepare and delicious starter of poached, or confit, trout with spinach, pomme purée (mash!) and chorizo oil also helped to enhance the mood. However, it was soon time to get down to the business end, as Daniel went on to demonstrate how to fillet the surprising large Fjord Trout. At first glance, you could have been mistaken that it was salmon he was working on but a quick clip around the ear, to pay attention, soon revealed that the flesh of Fjord Trout has a different fat distribution to salmon; particularly around the belly. Making cuts from that area a fine candidate for sashimi, such is it's mild, delicate flavour. Which in turn, is down to the habitat of the fish, the calm environs of Norway's crystal clear fjords. Healthy, clean, Nordic, you can just imagine it can't you. Just breathe that saltwater in. Daniel didn't clip me around the ear by the way but he did want people to concentrate and it was great to listen to him talk and to soak up some of his fevered passion. Not just about the fish - which is available in Tesco (points finger, winks) - but about how to approach cooking in general. The lead on dish or recipe he wanted us to make, was pan-roasted Fjord Trout with lentils, crispy bacon and chervil and on paper, it is a fairly simple approach. Not under Daniel's guidance though. "Ze bacon, it must be crisp, it must not stew in ze fat! Ze vegetables must be just cooked through, to soak up ze flavour of ze lentils! Ze dressing! 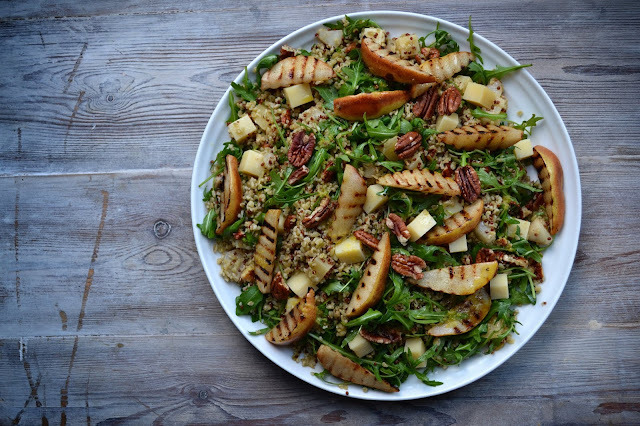 Do not put anything but Dijon in ze vinaigrette!" What with all these 'Ze's' I am throwing into the equation, I am doing a terrible injustice to Daniel's accent. He is from the Jura, in Eastern France. Not the Rhineland. He speaks with a wonderful soft lilt really. What I am trying to say, is that it was great to spend some time in the presence of someone who approaches food not only with joy, but also a fiery and somewhat maniacal intent. It's infectious. Watching him go doesn't arf give you a stiff neck though. I attended as a guest of Great British Chefs and Norwegian Seafood Council. 1 - To begin, place the lentils in a small saucepan and cover with cold water. Bring to the boil and skim away any foam that rises to the surface. 2 - Add the shallot, carrot, bouquet garni and garlic, reduce the heat to low and simmer for 10 minutes, or until al dente. 3 - Strain, reserving 2 tbsp of the cooking liquid and remove and reserve the shallot and carrot. Discard the garlic and bouquet garni. 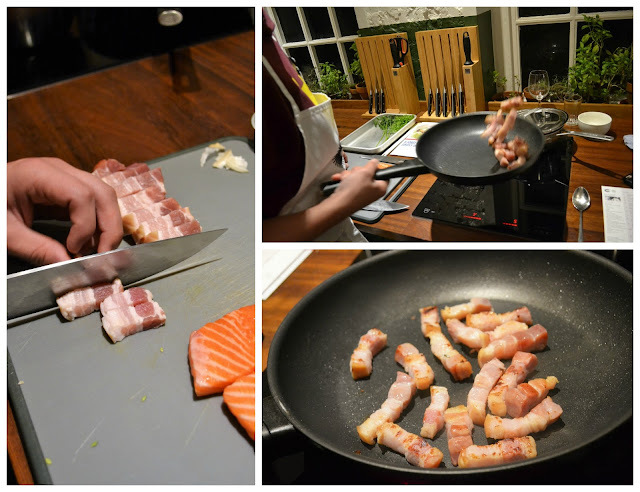 5 - While the lentils are cooking, cut the bacon into lardons or small pieces and place in a pan over a medium heat. 6 - Cook the bacon, stirring frequently until the fat renders down and the bacon starts to brown and crisp up. When ready, remove from the pan and onto absorbent paper towel. Leave in a warm place until required. 9 - Once the butter is melted and foaming, remove the pan from the stove and allow the residual heat to cook the fish for 1 additional minute. It should still be pink in the middle and feel very tender to the touch. 10 - During the last few minutes of cooking the trout, return the lentils to the heat, cut the shallot into long rustic strips and the carrot into a combination of fine dice and julienne. Add a dash more of the reserved lentil cooking liquid. Once hot, remove from the heat and finish with the vinaigrette and chopped chervil. 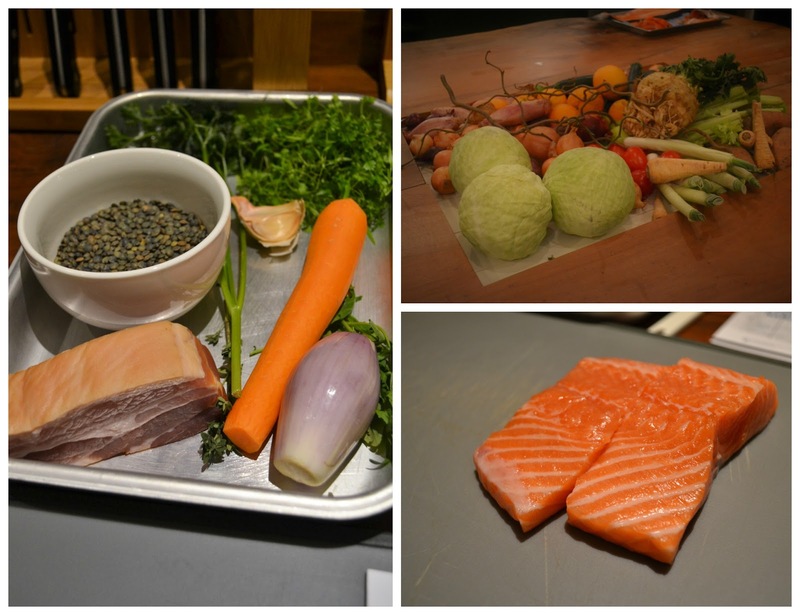 11 - To plate, add the hot lentils to each bowl, followed by the seared trout. Finish with the shallot, carrot, crispy bacon, rocket and cress. This is very useful post, Thanks for sharing this information with us.